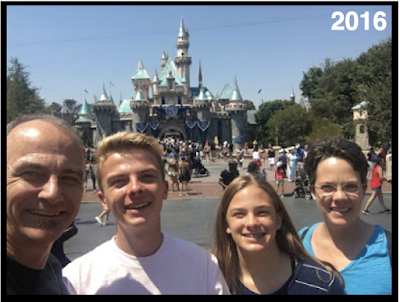 My wife, kids, and I have been fortunate to enjoy a once a year "day at Disneyland" - including this past June. We had a chance to spend the day at both Disneyland and the adjacent Disney California Adventure (pictured above). Of the hundreds of posts on this blog, I think I've only written about Disneyland once before. As we're "experiencing Los Angeles" - I've tried to focus on either day-to-day experiences or special things that are either free or inexpensive. Disneyland is fun. But it's not free or inexpensive. 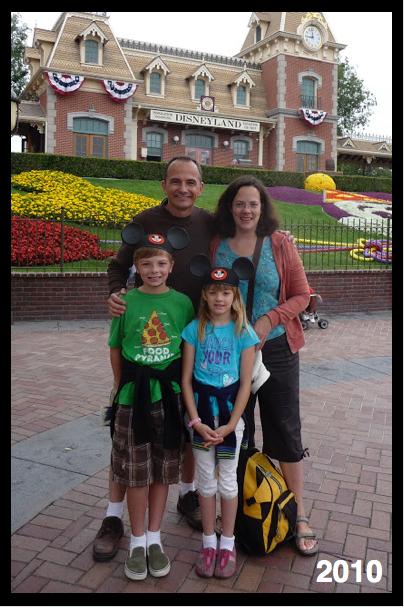 Throwback photo: this was from our last year living in Los Angeles at the entrance to Disneyland. Our situation has been unique, as we've been fortunate to have a friend who who signs us in for free once a year. He works as an imagineer - that is, someone who actually designs the rides and attractions. How cool is that? 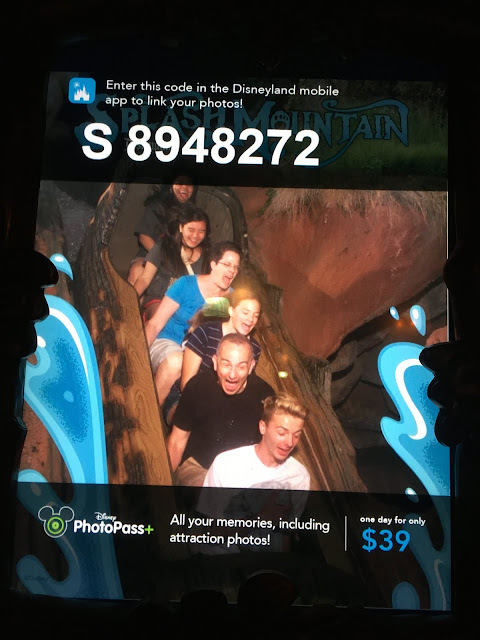 If you're one of the one million "annual passholders" - you might want to skip this post - or leave a comment on something we missed. If you're looking for jaw dropping photos, you might want to try here. Tip one: Go early. What does that mean? Well, buy your tickets on-line ahead of time, eat a big breakfast before you go, and plan to be arrive before the parks open. You get the idea. 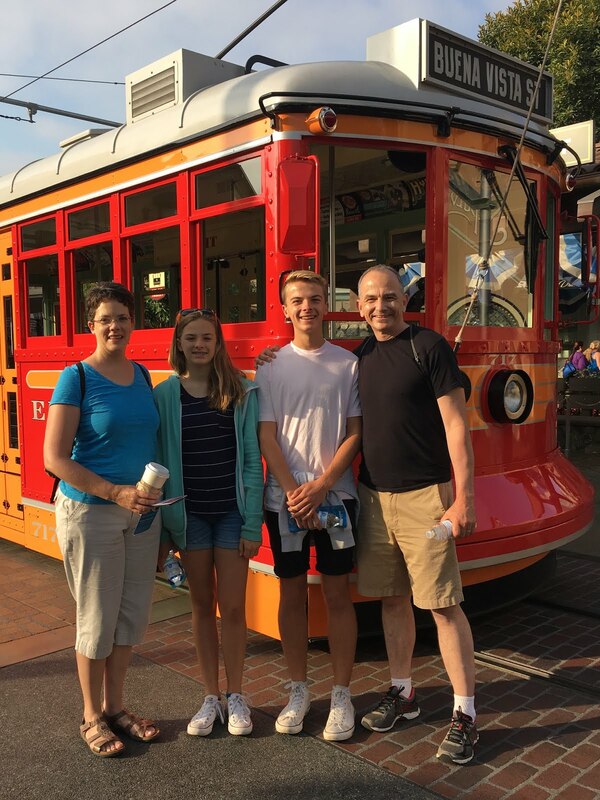 Tip two: Disneyland offers something called "Magic Mornings" -- allowing guests staying at one of their three hotels to get into one of the two parks an hour early. Unless you're staying in one of the Disney hotels, find out what park is NOT doing the "Magic Morning". Why? The park not doing "Magic Mornings" will be empty when you show up. You'll want to start there first. 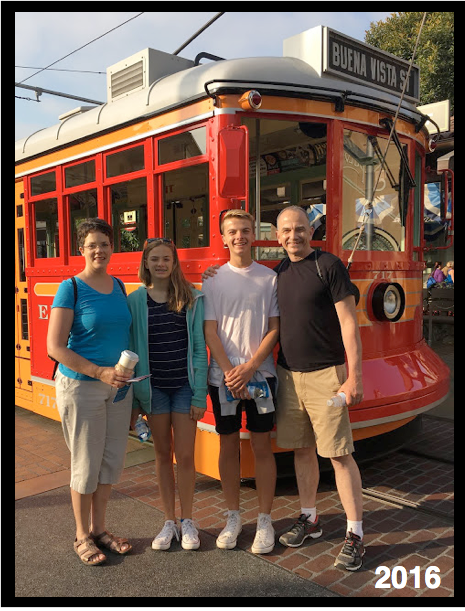 On the Saturday we went, Disneyland offered the "Magic Morning" -- so we started next door at Disney California Adventure. Tip three: plan on being at which ever park you're starting at 30 minutes before it opens. For us, that meant being there at 7:30am. If we get two teenagers out of bed early, you can too. Tip four: start with some of the most popular attractions. The ones that get very busy later. 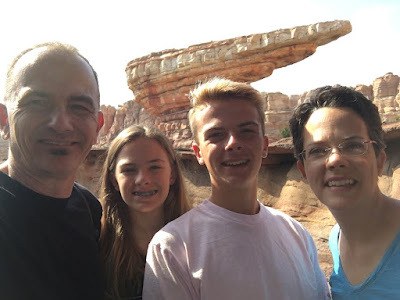 By the middle of the day, Radiator Springs Racers can have a 90-120 minute wait. But when the Disney California Adventure opened at 8am, it was a walk on. We also enjoyed Toy Story Midway Mania, plus a few other favorites in California Adventure, before walking over to Disneyland. 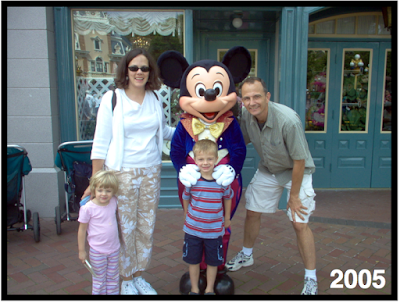 Interesting fact: despite being so much larger, Walt Disney World actually has fewer rides than the Disneyland Resort. Not shows, movies, displays, but rides. 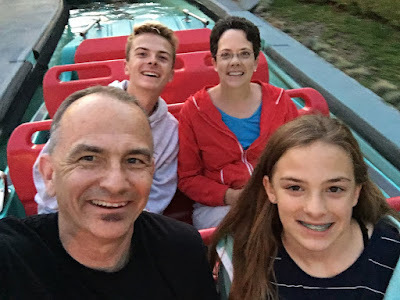 The four parks at Walt Disney World have a combined total of 50 "rides" - while the much smaller Disneyland Resort with just two parks has a combine total of 57. If you're looking for rides - you know, what most people go to a Disney Park for, in my opinion the Disneyland Resort really offers more show for the dough. Of course, if you're on the East Coast, a visit to Walt Disney World makes a lot more sense. 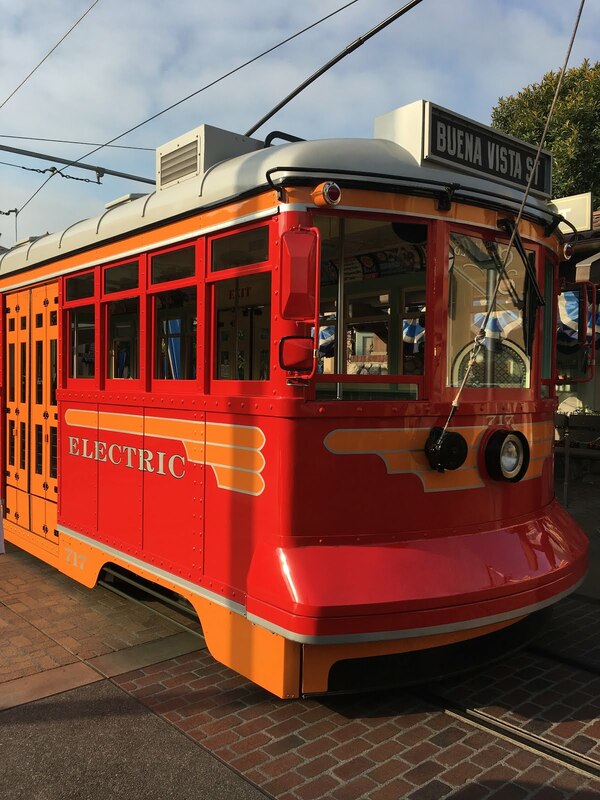 But if you you have a choice between the two, remember that in addition to having more rides, the Disneyland Resort has better weather, especially in the summer. And the fact that it's much smaller - more compact - makes getting around easier. The entrances to Disneyland and California Adventure are about 100 yards apart. Obligatory family photo in front of the Sleeping Beauty Castle. 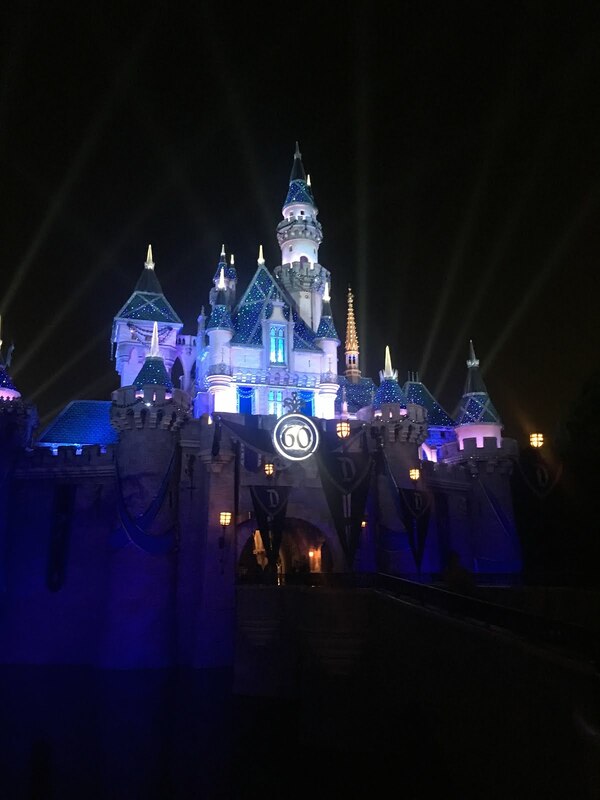 The "bling" on the castle last summer was for the 18 month long 60th anniversary celebration. Eleven years earlier this was back when our kids were just 5 and 2 1/2. And the year we moved to Los Angeles. 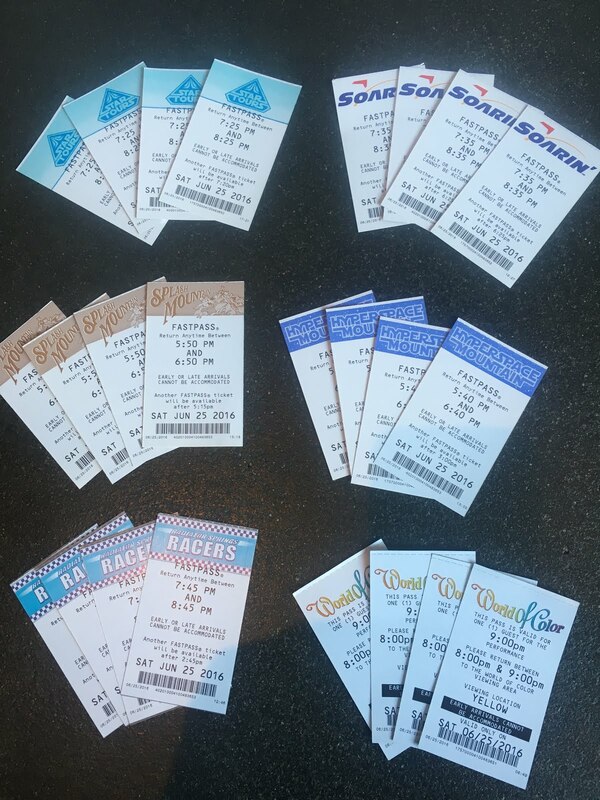 Tip five: start collecting and using Fast Passes early! Believe it or not, we ended up with more than we could actually use. Which is not a bad thing. Here's a link to a short article from one site on all you need to know on using Fast Passes. Hate waiting in line? Use Fast Pass. Want to go on more rides? Use Fast Pass. Want your kids to have a more enjoyable experience? Use Fast Pass. Want to get more bang for your buck? Use Fast Pass. Yes, of course, we still had to wait in some lines. But thanks to Fast Pass, were were able to see and do much more. On the one day our family went, a fairly crowded Saturday in late June, thanks for getting there early and using Fast Pass, we were able to enjoy over 20 different rides and attractions. Tip Six: bring some snacks to munch on late morning, and then plan for a big lunch around 2:00pm. The restaurants are certainly less crowded in the afternoon. And Disneyland has some great food options. Skip the corndog, spend a bit more $$ and you'll get a real meal. We've enjoyed the French Market in New Orleans Square, but are especially fond of the Plaza Inn, at the end of Main Street. Our lunch was huge - we weren't even hungry at dinner, were happy with a late snack. Tip Seven: Unlike other amusement parks, Disneyland is OK with you snapping a photo of their attraction photos. This was Splash Mountain. You could splurge and pay $39 for Disney PhotoPass. Or, you could save that cash for something else ... just sayin'. By the way, the wait time for Splash Mountain was over a hour. With our Fast Pass, we waited less than five minutes. Even on a very busy day. During one of the parades, they were sending boats through "It's a Small World" with few, or even zero, people. Our family got our own boat. So, tip "seven and a half" might be going on "It's a Small World" during the parade. Speaking of saving money, what about purchasing an Annual Pass? We lived in Los Angeles for five years and never considered annual passes. Having a friend who could get us in once a year for free was part of the reason. An annual pass always seemed like an "all you can eat dessert bar" - too much of a good thing. If you spend hundreds of dollars on annual pass, you want to get your money's worth, right? It was (and is) fun to go once a year - and make it a special time. As parents, we wanted to limit the "Disney influence" on our kids. Kind of like trick or treating: fine once a year. More than that, maybe not so good. "If you find honey, eat just enough -- too much of it, and you will vomit." wrote King Solomon (Prov 25:16). Obviously, people - including some close friends - have different views on this. I would say, if you live in Los Angeles there's a lot of other ways to spend your money and your time - much of which is free, or very inexpensive. Tip Eight: Get and use the Disneyland App on your phone. The App includes maps of both Disneyland and Disney California Adventure, with ride wait times and Fast Pass return times. "It's a Small World" and "Pirates of the Caribbean" are both high capacity rides. On busy days, their long lines can move fast. Meanwhile, Peter Pan, the popular 60 year old dark ride, has very low capacity - with notorious long waits. Use the App to find out what lines are shortest. And, of course, use Fast Pass. Tip Nine: Expect, but try to avoid, crowds. Disneyland is in a metro area of 16 million people. 1/8th of the US population lives in California. And Disneyland has ONE MILLION annual pass holders. 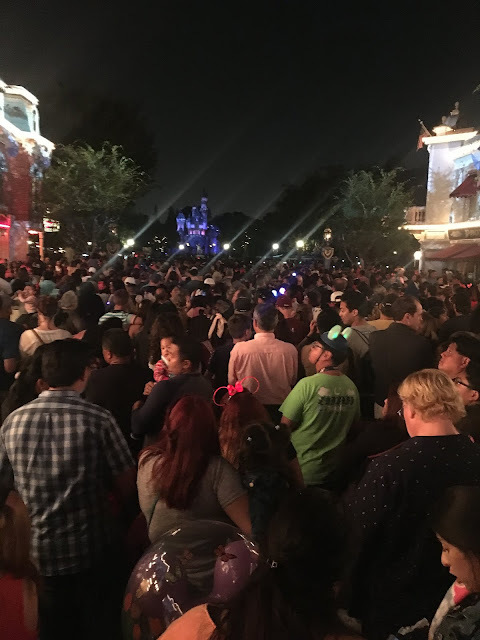 There are days when literally 50% of the people at Disneyland are annual passholders. Here's a link to some suggestions of times to go when it's not as crowded. Of course, if your traveling from out of town, you might not have a choice of when you can visit. That said - DO NOT go during Christmas. The two weeks around Christmas can be so crowded that Disneyland literally closes it's gates and will not allow anyone else in. Trust me, during Christmas it is wall to wall people, with long lines for everything, including the bathrooms. Avoid going the two weeks around Christmas at all costs. Yes, the Saturday in June when we went it was crowded to watch the fireworks. Some folks were waiting for 2 or 3 hours in front of the castle for prime viewing. Wow. Really? No thanks. Main Street is still crowded, but we were able to show up 15 minutes before the fireworks and still see the fireworks AND the cool projections on the buildings. If you're planning on putting your kids on your shoulders, please try not to block someone else's view. After the fireworks, we found a spot across from the Matterhorn (near Alice in Wonderland) to view the "Paint the Night" parade. We ended up staying until midnight when Disneyland closed. As an adult, my favorite time is between 11pm - midnight. Of course, that didn't work when our kid were little. Now they're up for it. As an aside, during the summer Disneyland use to stay open until 1pm. THAT was fun. Poking around the internet, I found this link to some additional tips on maximizing your time there. Enjoy. Tip Ten: It's about the people you're with. While I hope these "maximize your time there" tips are helpful - at the end of the day, it's not about the rides, the shows, or the fireworks. It's about the people you're with. And that's something that can be enjoyed at a park, a museum, the beach, or your backyard.